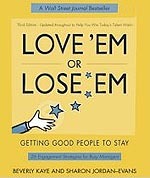 "Regardless of economic swings, you need your high-potential employees to stay, be engaged, motivated and productive. They're critical to your success--and your competitors want them." Dr. Beverly Kaye is an internationally recognized authority on career issues, and retention & engagement in the workplace. As founder and CEO of Career Systems International, and a best selling author on workplace performance, Dr. Kaye has worked with a host of organizations to establish cutting-edge, award-winning career development solutions. Her clients are leading global organizations including American Express, Citigroup, Constellation Energy, DaimlerChrysler, Dow Corning, Hallmark, Lockheed Martin, Microsoft, Marriott, Novartis, and Starbucks.